They’re sweet, with deep flavour and very juicy. Local isn’t always best! Many tomatoes are grown under heated glass out of season, at huge environmental cost. When we can’t grow tomatoes at home without heat, we truck over naturally sun-ripened ones from our grower Paco Locano in Spain. In a project with Exeter University, we discovered that this uses just a tenth of the carbon compared with growing them in the UK, using heat. Extremely versatile - use fresh in salads or use in sauces, soups and savoury dishes. Dry them to use in winter or use green tomatoes in chutney. Try making your own fresh salsa by chopping them, adding red or fresh onions and a green herb and well as a squeeze of lemon, vinegar and a bit of sugar, salt and pepper. It’s great with tortilla chips or on a courgette fritter. Delivered from our farm, so wash before cooking. Best kept out of the fridge and on a cool veg rack. 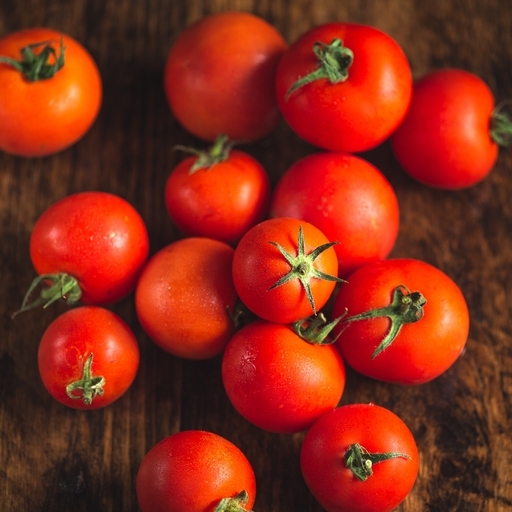 Underripe tomatoes can be kept at room temperature, very ripe in the fridge - but bring to room temperature before eating for flavour. Our season lasts from June to mid September. The rest of the year tomatoes come from our Spanish growers. Using cold tunnels, we can extend the season from June to mid October, which is as far as we go at Riverford. Under heated glass, tomatoes can be picked from March to Christmas but the energy used results in about 2 kilos of carbon dioxide being pumped into the atmosphere for every kilo of tomatoes produced. Where waste or low-grade heat is used from combined heat and power electricity generation or other sources, it can make sense, but generally, if we must eat tomatoes earlier than July or later than October, from a taste and environmental perspective it would be better to import them. Better still, just give them a miss in their fresh form from November to April. Our tomatoes are sold as class 2. This means that they might not look cosmetically perfect, but they are grown for the very best flavour. (We have to tell you this to satisfy some EU rules).